This past weekend we went on a family reunion to Durango, CO. It was so much fun! Here are some pictures of what we saw on our trip! We went on a Hummer and train ride from Durango to Silverton. On the hummer ride we road all over the mountains! It was gorgeous! Here are some pictures for you to enjoy! This picture was taken on the train. This is the silverton train that we got to ride on! Our tour guide drove us to the top of this mountain. It is over 13,000 feet above sea level. This is a picture that was taken on the very top of that mountain. Isn't is pretty? 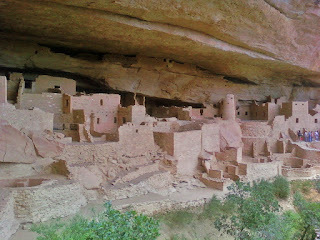 This is Mesa Verde. It is a place where the pueblo indians lived a long time ago. These two pictures are of the same place, this is the Cliff Palace. It was amazing to see how they built their homes and churches. This is where we stayed. It's about 20 miles northeast from Durango. 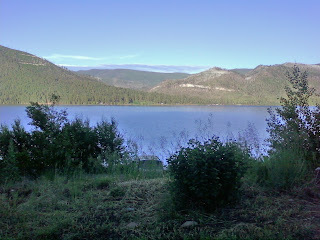 It is called Lake Vallecito. It was breathtaking! This picture just doesn't do it justice.